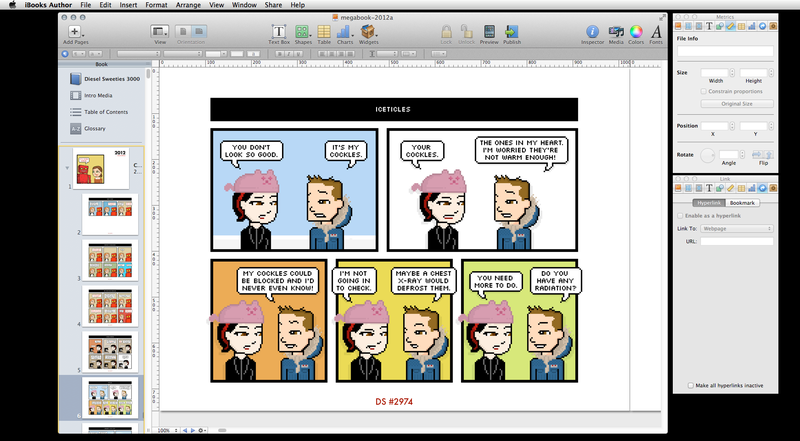 Cartoonist, tech spelunker, pixel perfectionist, t-shirt humorist: Rich Stevens has traded in all manner of digital delights since his webcomic Diesel Sweeties first came into the world in 2000. For the comic’s 3000-strip "anniversary," Stevens celebrated by embarking on one of his biggest projects to date: constructing a 3300-page ebook with Apple’s iBooks Author. I stepped into Stevens’s virtual office to chat about the trials and tribulations of building ebooks, the beauty of the PowerBook 190cs, and the future of Apple touchscreen desktops. Heh, which one? My first Apple was a IIgs that my mom got us when I was a kid. My first real Mac was a used SE I bought in high school. The first computer in my unbroken chain of Photoshopping Macs was a PowerBook 190cs that I got in college. I worked as a mailman the summer after my freshman year and bought it on clearance with the money. It had 8 megs of RAM! I could run QuarkXPress. And email! And what tech are you currently rocking? I have a kind of fluid setup. I buy stuff when I can, or when I find a bargain. [I] mix and match a lot. My current main setup is a 2012 15-inch Retina MacBook Pro that does double-duty between being portable and being a Thunderbolt disk that I boot my drawing-desk iMac off of. I am old-school in that I feel like I get more work done with a stable desk location. This little droid-duo is where I do all my drawing work and book production. I’ve gone back to doing all my drawing with a mouse (a wired Evoluent ergonomic mouse) and also rock a Magic Trackpad for ambidextrous working. It’s easier on the wrists. Self-portrait: Rich Stevens and his desk. In my shipping office, I’ve recently gone back to an older iMac that I souped up. It’s a 2007 2GHz machine that I boot off a Firewire SSD. Mavericks is pretty impressive. This 6-plus-year-old machine still handles browsing and mailing labels like a champ. 3000 comics is a pretty crazy milestone. What spurred you into celebrating it with an ebook? Honestly? I just enjoy putting my work in weird corners of technology before anyone else gets there. I wanted to collect my strips at number 3000 and figured a modest Kickstarter would help me actually complete the task. Ebooks are definitely a weird corner of technology right now! Had you experimented with them before? Making, reading? I’d dinked around with Kindle and EPUB files in the past, but it never went anywhere because there was no compelling reason for a person to read color comics that way over a website or PDF until the iPad came along. I’ve been a Kindle fan since they came out, but the greyscale models are pretty lousy for comics. How did getting funding through Kickstarter help the project? Were you worried about getting everything done within a specific time frame? It enabled me to spend more time on the ebooks than I planned, but seeing as it was new territory, I didn’t have an established timeline. I basically forced myself to do them before a big summer comics convention and just made it—beat [up] my arm, but I made it. I’ve still got to finish some of the non-ebook stuff, but at least I got the majority of the work done fast. From the start, your goal was to produce an ebook that could be read on your Mac, iPad, tablet, etc. Did you have any trouble building for multiple formats? One important thing I learned about tablets during this process is that screen proportions really matter. The 4:3 screen on an iPad is so much more usable and comfortable for reading than the typical 16:9 screen on an Android device. Movie screens are for walls! What did you have to do to your content to get it ready for ebook publication? This was your first iBooks Author project, right? How did you embark upon learning the tools? I asked some friends here and there, but mostly I experimented with smaller projects. I did some little monthly “magazine” style reprints of my work while I figured out the details. I’m a firm believer in learning by doing. We all have them—what’s your biggest frustration with iBooks Author? I only had one frustration, to be honest: You can’t automate importing images. My pages were all virtually identical aside from the image file of choice, so that would have sped things up. Otherwise, once I figured out how to make Retina pixel art look sharp, it was pretty easy. The Diesel Sweeties ebook ended up including over 3000 images. It was kind of jarring moving back and forth between the Adobe palettes I use in every other app and Apple’s style, but I can’t really fault Apple for that. The finished product has over 3300 pages and 3000 comics. Do you think you’ll ever tackle this big a project again? What about other ebook ventures? I don’t think I’d recommend doing an ebook this large with these tools in this method again. I feel like iBooks was built for people designing much smaller, fussier books with bigger budgets. It’s a great set of tools, but I’d be dumb not to look into some kind of automated EPUB script or something if I were doing this again. What’s missing from the ebook production space that you’d like to see? I’m perplexed that iBooks files don’t support animated GIFs. Notifications would be nice, but that veers into app territory. It would also be nice if you could easily pop a large image into a smaller frame and scroll it full-screen somehow. If you could have any tech setup (real or fictional), what would you build? Honestly? I kind of already have it. I dock a fast SSD to a big desktop so I can focus, but I can also travel with it. Most people think that something like a touchscreen iMac is the future of desktops, but I disagree. I think we need those touch screens on the desk. Maybe some kind of combined glass multitouch keyboard that also handles trackpad duties. I’d love a super flat desk that wouldn’t attract crumbs.